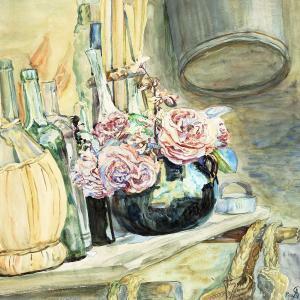 Find artworks, auction results, sale prices and pictures of Anna L., Née Hansen Syberg at auctions worldwide. Pink roses and Chianti bottle on a sill. Signedwith monogram and dated Pisa 1911. Visible size 54 x 51 cm. Anna and Fritz Syberg and their six children went to stayin Pisa from 1910 to 1913. The painter Kristian Zahrtmannhad recommended this picturesque town. They travelled backto Denmark because Anna was pregnant. She died within ayear after their 7th child was born. Interiorwith a chair and a potted plant. Interior with a chair and a potted plant. Lead and watercolor on paper. The paper has turned slightlybrown. 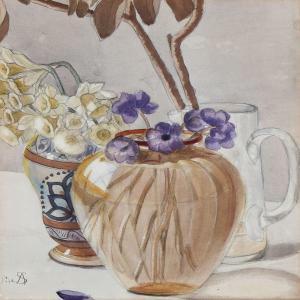 Vases with flowers on a table. Signed with monogram Pisa. Watercolour and pencil on paper laid on cardboard. Sheet size 45 x 35.5 cm. Unframed. Summer flowers in a vase. Signed with monogram and dated 01. Oil on canvas. 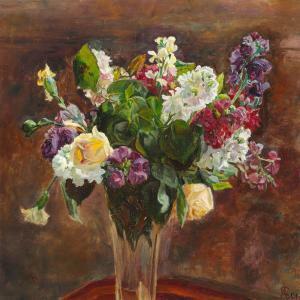 41.5 x 44.5 cm. 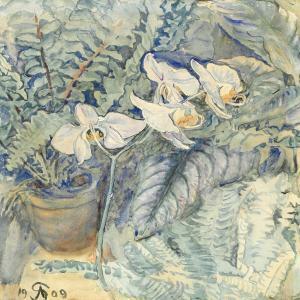 Orchid and ferns. 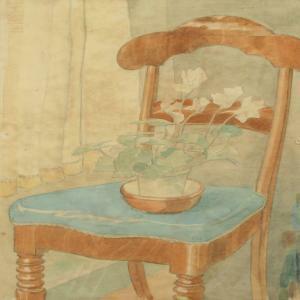 Signed with monogram and dated 1909. Watercolour on paper. Visible size 37 x 33 cm. Exhibition label on the back of the frame.